In nearby Westminster recently, three people were injured – one of those critically – in a fiery, head-on collision on Worcester Road. Our Boston burn injury lawyers understand that while the exact details of what caused the initial crash are unclear, one of the vehicles involved burst into flames, causing the occupants to suffer serious burns, in addition to to the injuries they had already incurred as a result of the impact. 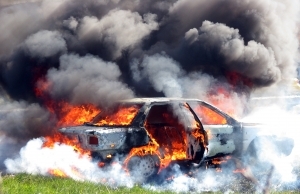 Motor vehicle fires are a major cause of burn injuries each year in the U.S. When two vehicles hit, fuel tanks may rupture. This could result in a very dangerous fuel-fed fire. In some cases, fuel tanks have been known to explode, which then turns the car’s parts into perilous projectiles. Other potential causes of vehicle fires include things like fluid leaks in the exhaust system or faulty wiring. Either way, these fires have the propensity to spread rapidly because of highly-flammable gas, grease, oil and other fuels that are present. Sadly, when this happens, passengers can become trapped, potentially suffering life-threatening burns. Sometimes, the crash itself has rendered the victims unconscious and unable to react quickly to the dangerous circumstances. Additionally, those nearby are put at risk in these situations as well. Not only are they at risk simply by passing by, but those who attempt to help may find themselves severely burned or injured. That was the case in this Westminster crash, which happened just after 9:30 p.m. on a Thursday. Officials say a nearby resident, who has some type of emergency response training, rushed to the aid of the trapped passengers. He was able to get at least one passenger out and provide critical care to that individual until police arrived. In the course of helping, he sustained third-degree burns. When police got there, they tried to put out the fire using hand-held fire extinguishers as two of the occupants remained inside. When firefighters arrived, they too worked on putting out the blaze with canisters. While they were able to control the fire initially, it was not enough to get the two out immediately, and the emergency personnel were forced back by the flames. With dogged persistence, though, they outfitted a shield for the passengers in order to protect them from the flames until they could get the hose hooked up to a nearby hydrant in order to put out the fire once and for all. Finally, they were able to quell the flames and pull the two remaining victims free using the Jaws of Life. Later reports were that two male passengers in their 50s were treated for moderate injuries, while a female passenger in her 20s was recovering in the intensive care unit, with her condition having been recently upgraded to fair. The National Fire Protection Association reports that 33 car fires are reported every hour in this country, with about 18 percent of those happening on a highway or road. About 1 person or more dies every day in a vehicle fire. In 2007, the most recent year for which data is available, there were roughly 260,000 reported vehicle fires that caused nearly 400 deaths, 1,700 injuries and more than $1.4 billion worth of damage. The most likely to be involved in these crashes are young adults and teenagers. It’s worth noting that most insurance does not cover vehicle fires, unless you have extensive coverage. A lot of these situations are preventable, as the accidents that cause the fires in the first place are often due to the carelessness or negligence of another. What you CAN do is ensure your vehicle is in good working order so that you can minimize your risks. You want to get in the habit of having your car checked out and tuned up at least once annually. Part of that should include looking to identify any oil or gas leaks. If you notice that a fuse is continuing to blow, that means there is a high likelihood of electrical trouble, so it’s not something you should ignore. If your car does catch fire, no matter what the cause, your goal should be about getting yourself and any children out of the car as soon as possible and calling for help. You shouldn’t try to put the flames out yourself, particularly if the fire is at the rear of the vehicle, as there is a strong likelihood the gas tank could explode, causing severe injuries.